JUNE 7 2012 BUDGET WORKSHOP NO. 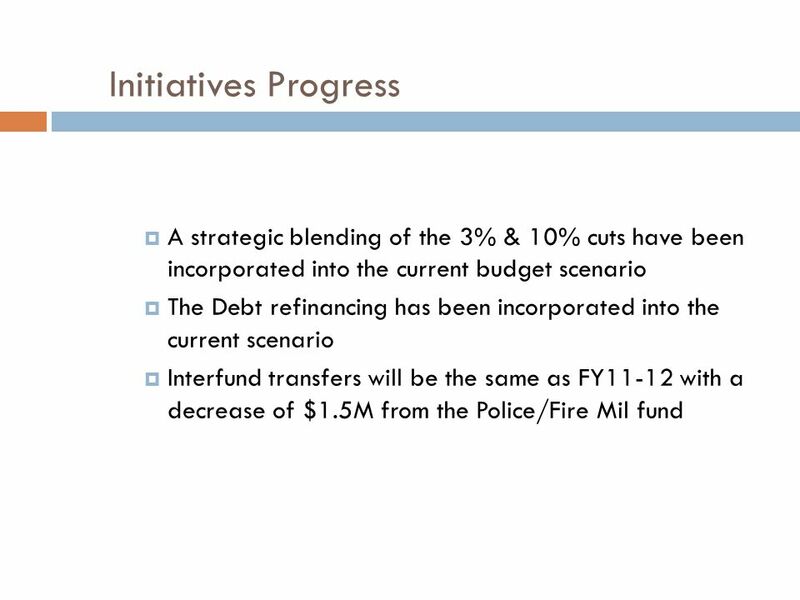 1 12-13 FISCAL YEAR BUDGET FORMAT Innovation will serve to keep the plan in the forefront of all that we do. Our actions. 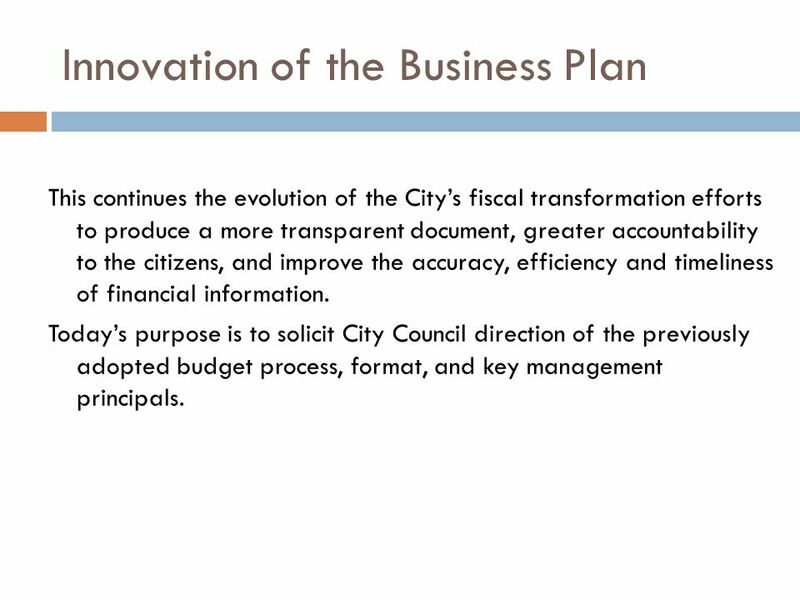 2 Innovation of the Business Plan This continues the evolution of the City’s fiscal transformation efforts to produce a more transparent document, greater accountability to the citizens, and improve the accuracy, efficiency and timeliness of financial information. Today’s purpose is to solicit City Council direction of the previously adopted budget process, format, and key management principals. 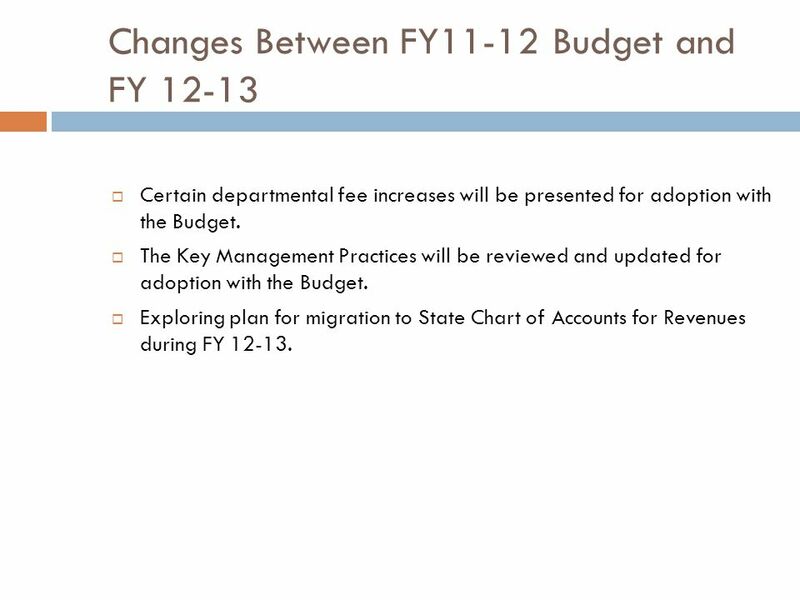 5 Changes Between FY11-12 Budget and FY 12-13  Certain departmental fee increases will be presented for adoption with the Budget. 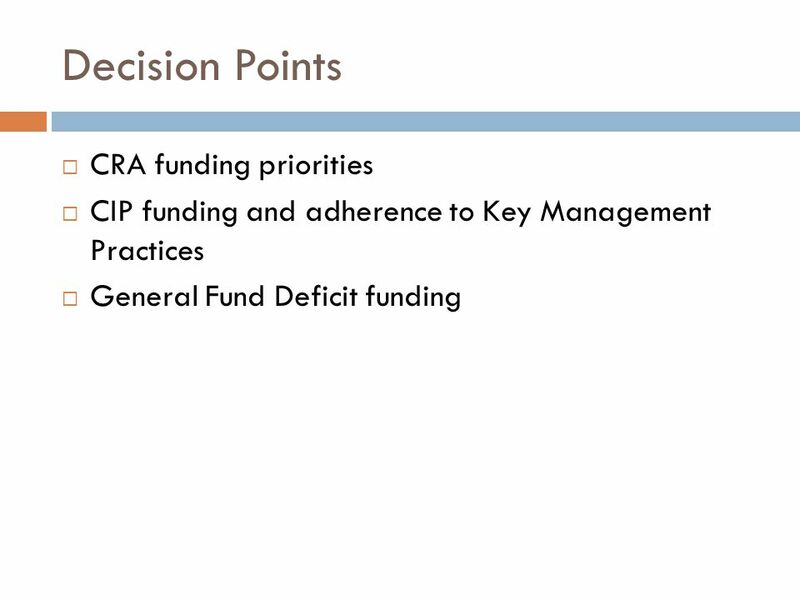  The Key Management Practices will be reviewed and updated for adoption with the Budget. 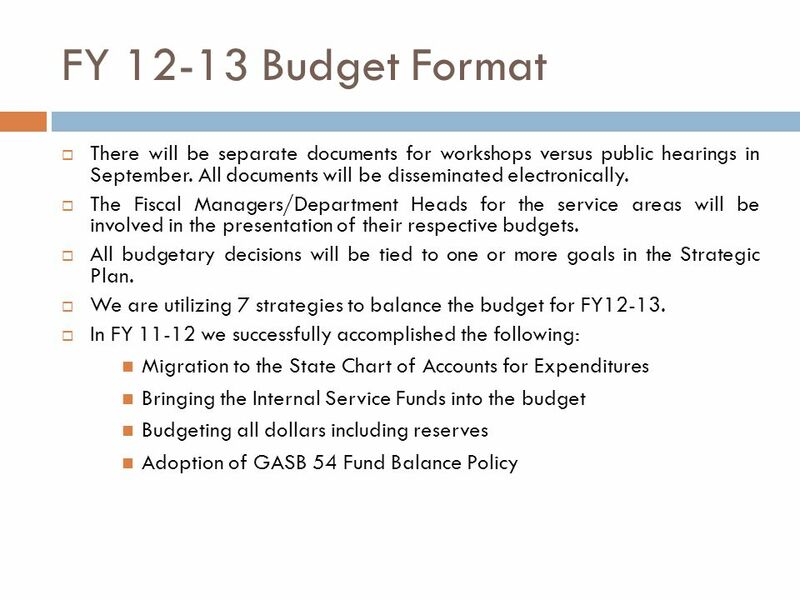  Exploring plan for migration to State Chart of Accounts for Revenues during FY 12-13. 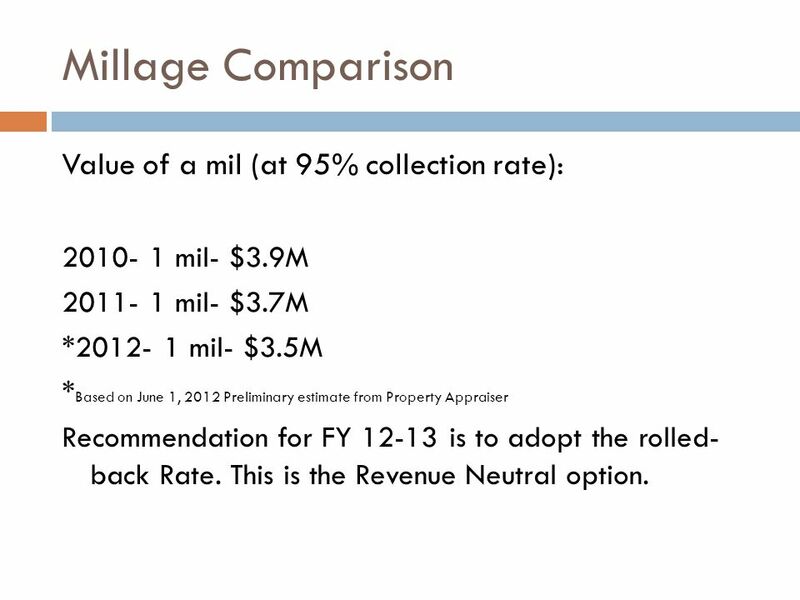 9 Millage Comparison Value of a mil (at 95% collection rate): 2010- 1 mil- $3.9M 2011- 1 mil- $3.7M *2012- 1 mil- $3.5M * Based on June 1, 2012 Preliminary estimate from Property Appraiser Recommendation for FY 12-13 is to adopt the rolled- back Rate. This is the Revenue Neutral option. 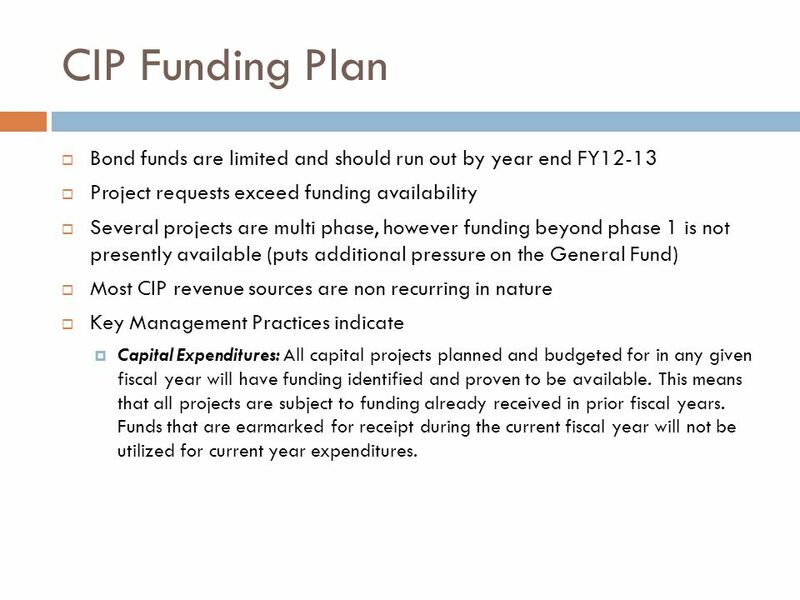 13 CIP Funding Plan  Bond funds are limited and should run out by year end FY12-13  Project requests exceed funding availability  Several projects are multi phase, however funding beyond phase 1 is not presently available (puts additional pressure on the General Fund)  Most CIP revenue sources are non recurring in nature  Key Management Practices indicate  Capital Expenditures: All capital projects planned and budgeted for in any given fiscal year will have funding identified and proven to be available. 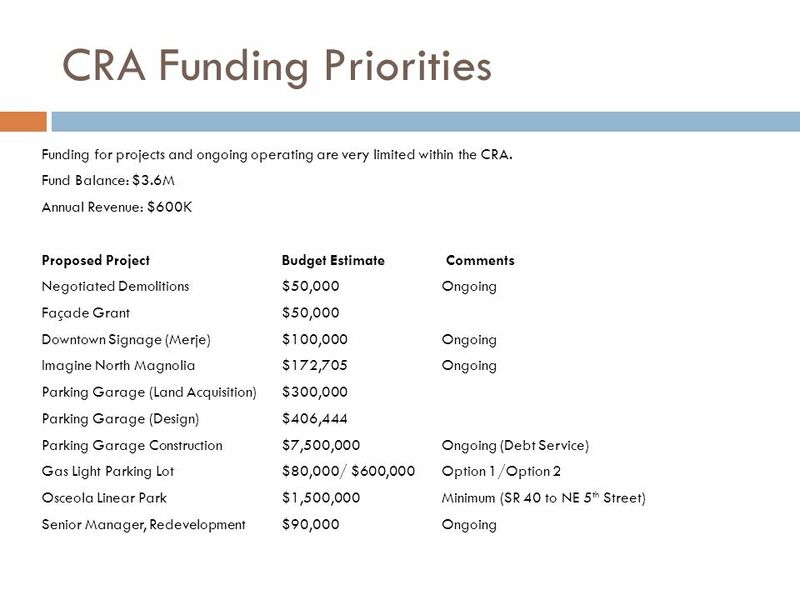 This means that all projects are subject to funding already received in prior fiscal years. 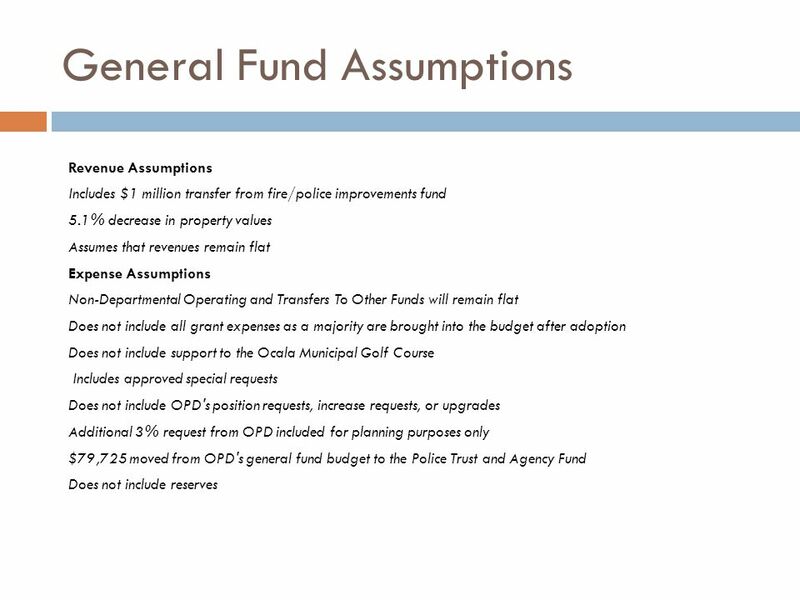 Funds that are earmarked for receipt during the current fiscal year will not be utilized for current year expenditures. 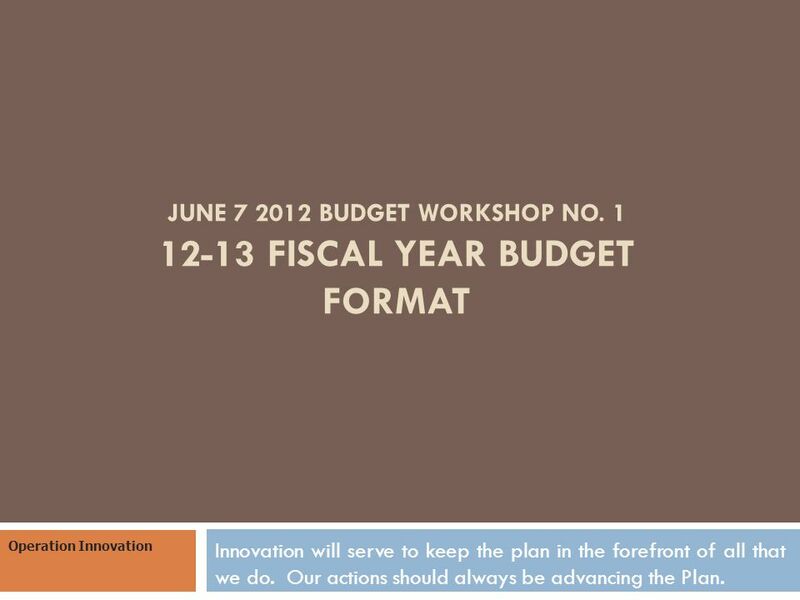 Download ppt "JUNE 7 2012 BUDGET WORKSHOP NO. 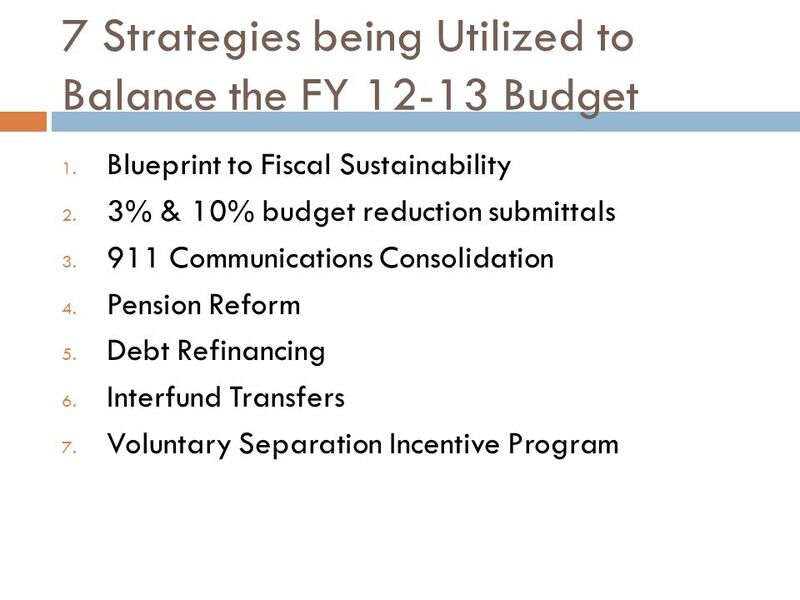 1 12-13 FISCAL YEAR BUDGET FORMAT Innovation will serve to keep the plan in the forefront of all that we do. Our actions." 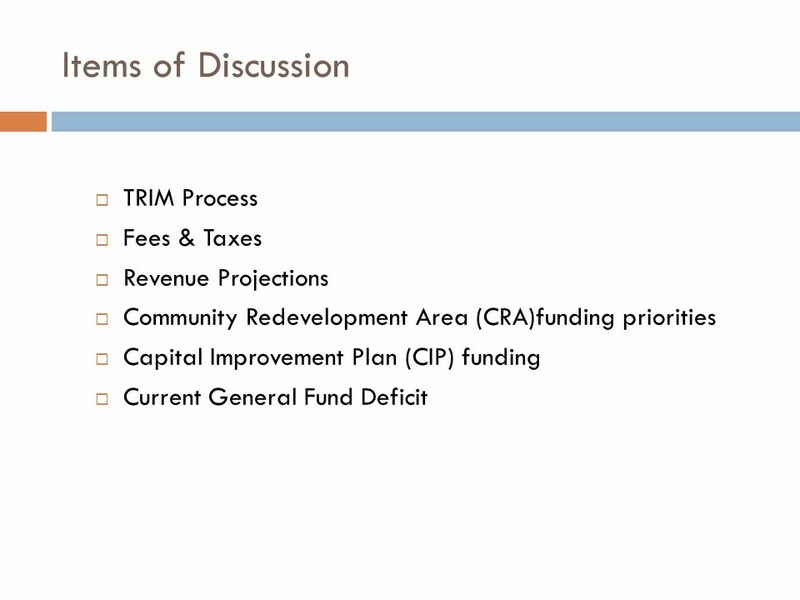 Foothill MWD Preliminary Budget Presentation May 20, 2013. 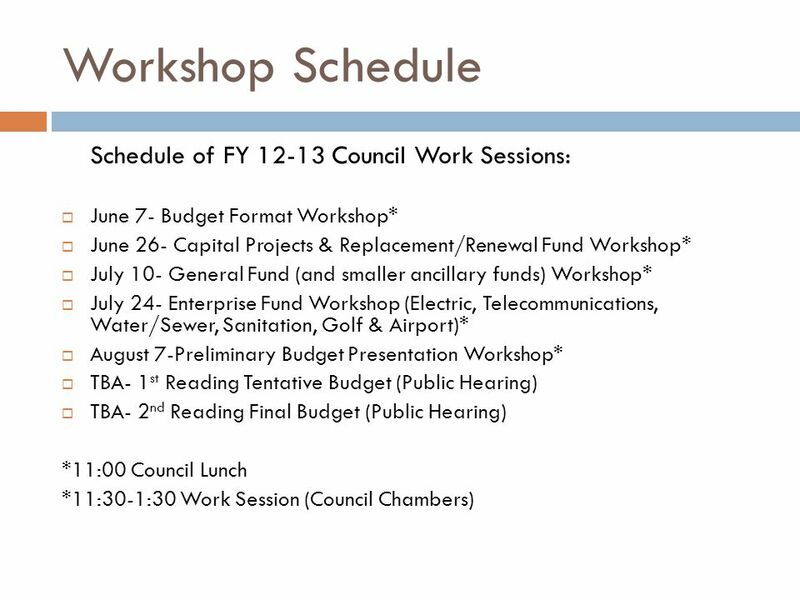 May 14th–18th, Mayors Opening Comments Overview of Budget Process Budget Picture City Wide Budget General Fund Overview Water & Waste Water Funds. Budget Strategy Presented by Mayor Don Ness To the Duluth City Council June 9, 2008. 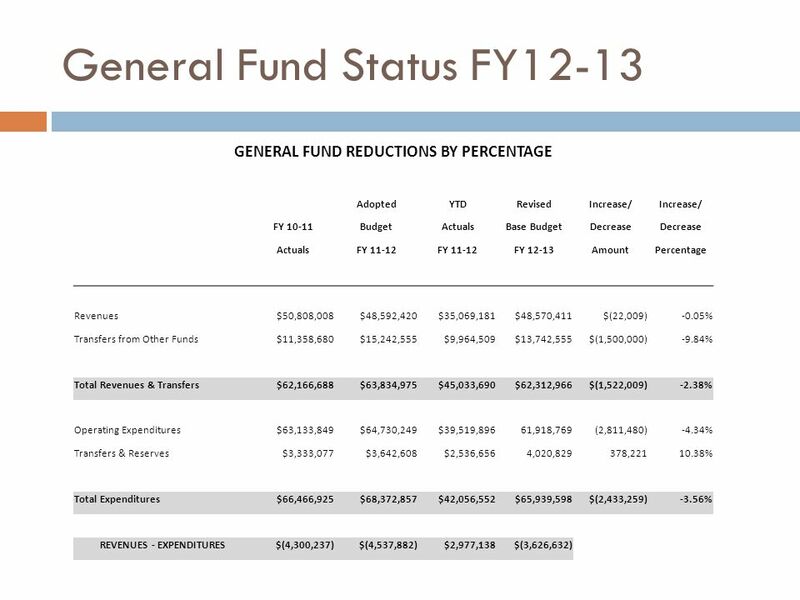 May 7, 2012 General Overview FY 2013 Budget. Objectives 2 General financial overview  Detailed financial and economic presentation will be presented. FY12 and FY13 Budget Development Special Board Meeting Alachua County Office of Management and Budget June 7, 2011. 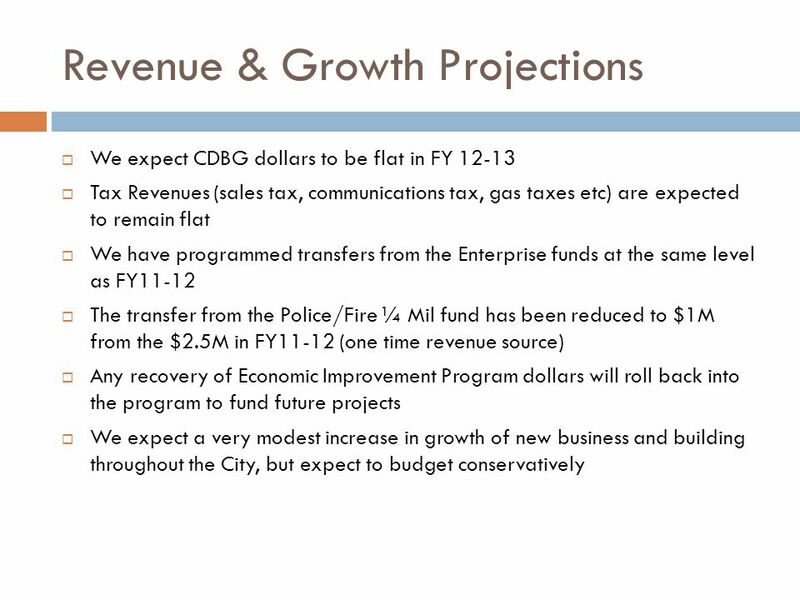 FY 2009 First Quarter Update & Economic Impacts on the City’s Budget December 8, 2008. 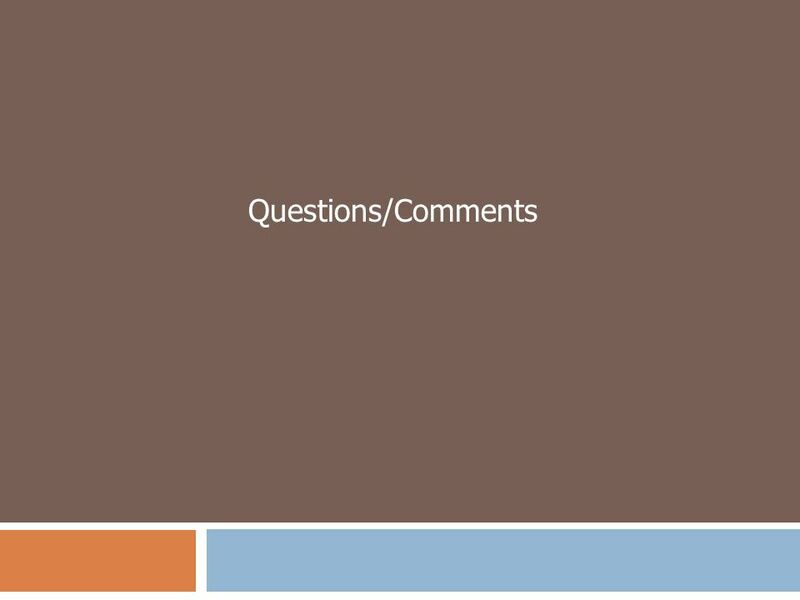 Fiscal Year 2012/13 Mid-Year Budget Report. 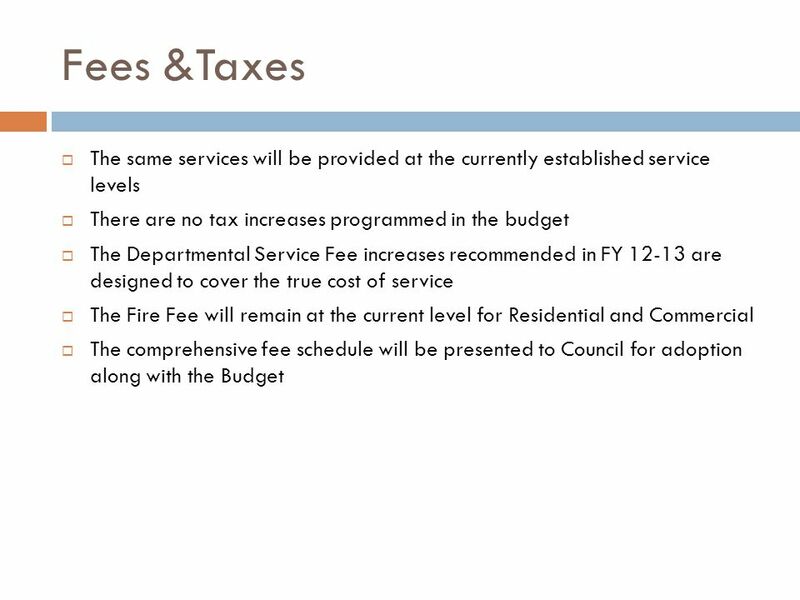 Budget Balancing for FY 12/13 and 13/14 FY 12/13 Expenditures Sheriff $ (6.2) PSEC Salary Increase Patrols. Budget Advisory Committee, September 16 th, 2011 FY11/12 SUNY ONEONTA STATE PURPOSES BUDGET UPDATE. Douglas County School District Re.1 Preliminary Budget Fiscal Year 2010 – 2011 Presented to the Board of Education Tuesday April 20, 2010. JULY BUDGET WORKSHOP NO FISCAL YEAR ENTERPRISE FUNDS Innovation will serve to keep the plan in the forefront of all that we do. Our actions.